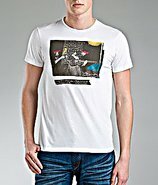 Generic - Gig Short sleeve tee is fashioned with a printed graphic at chest ribbed scoop neck and embroidered signature logo at left sleeve. BLUGIRL - Blouses organza logo embroidered detailing solid color short sleeves round collar no pockets. PENNYBLACK - Blouses crepe embroidered detailing beaded basic solid color rear closure button closing long sleeves round collar no pockets 2-piece set.
. - Vanilla Star Soraya Embroidered Blouse Tie dye embroidered blouse with tie front. Tie dye placement may vary. MANILA GRACE - Blouses Plain weave Embroidered detailing Solid color Turtleneck Short sleeves Front closure Button closing No pockets. LOCAL APPAREL - Blouses plain weave embroidered detailing stripes round collar long sleeves buttoned cuffs no pockets. BEAYUKMUI - Blouses cr ªpe embroidered detailing solid color round collar short sleeves no pockets. 25.10 PER MAURIZIO COLLECTION - Blouses plain weave embroidered detailing solid color short sleeves v-neck no pockets. SESSUN - Blouses plain weave embroidered detailing solid color front closure button closing short sleeves round collar no pockets. MAISON SCOTCH - Blouses satin jersey embroidered detailing basic solid color long sleeves round collar no pockets. SILVIAN HEACH - Blouses cr ªpe rhinestones embroidered detailing solid color round collar long sleeves no pockets. NOLITA - Blouses lace plain weave embroidered detailing solid color round collar long sleeves no pockets. Nike - Womens Nike N7 Graphic Tank - White/Black Celebrate Native American heritage with the Nike N7 collection. Embroidered Swoosh. 100% organic cotton. Imported. PF PAOLA FRANI - Blouses organza embroidered detailing two-tone pattern round collar short sleeves side closure zip closure no pockets. 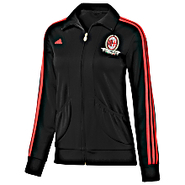 Adidas - Support your Rossoneri proudly in the adidas AC Milan Track Top. This soccer jacket features an embroidered crest and the 3-Stripes down the sleeves. A stand-up collar plus ribbed cuffs and hem keep out the elements. 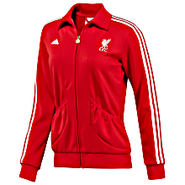 Adidas - You'll never walk alone in the adidas Liverpool FC Track Top. The embroidered logo team-themed zipper pull and blazing color show your loyalty and adidas 3-Stripes add authenticity. Features a stand-up collar to keep you cozy. MAURO GRIFONI - Blouses Plain weave Embroidered detailing Floral design 3/4 length sleeves Wide neckline Two breast pockets.